The OCBC Cycle Volunteer Program offers volunteers an exciting and memorable volunteer experience through various event roles available. In addition, volunteers get first hand unforgettable experience working behind the scenes of the Singapore’s biggest mass cycling event. 1.1 OCBC Cycle 2019 is Singapore’s premier cycling event which will be held at the Singapore Sports Hub on 11th and 12th May 2019. 4.1 The various roles are listed in the poster. 4.2 For ease of administration, offline registration will be made available for groups. 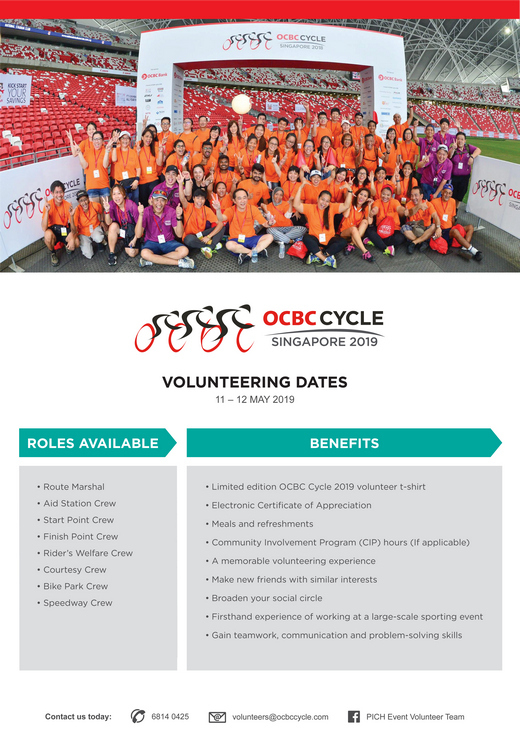 If you have any enquiries, please feel free to email volunteers@ocbccycle.com or 6814 0418.